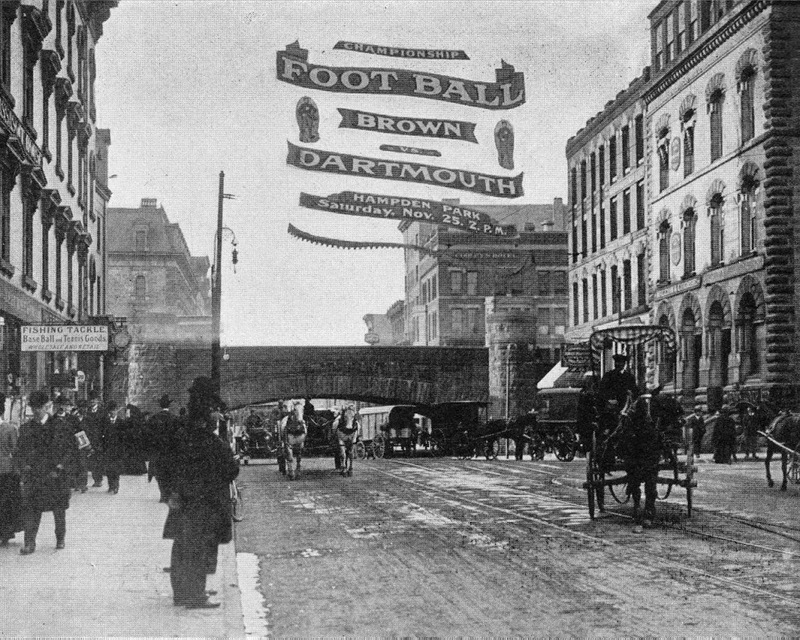 A banner in downtown Springfield advertising the Brown-Dartmouth football game at Hampden Park on November 25, 1905. Photo from Springfield: Present and Prospective, published in 1905. 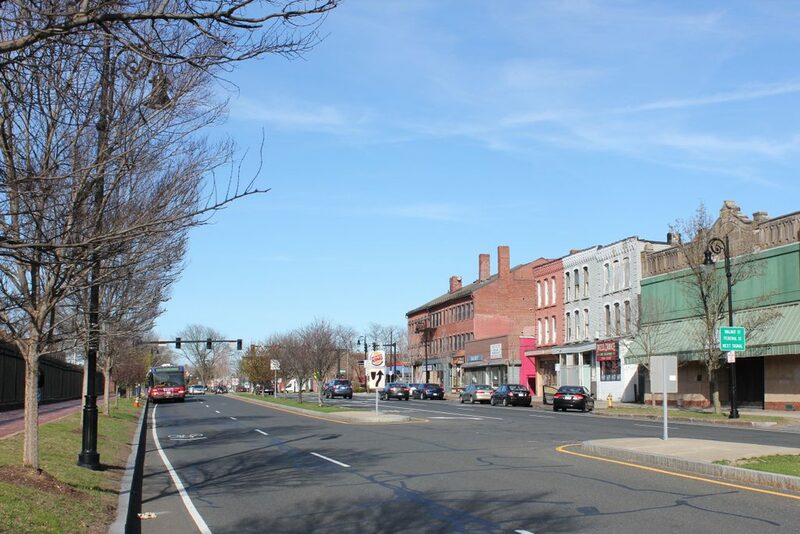 In terms of sports, Springfield may be best known as the birthplace of basketball, but it was also once the site of several significant college football games. 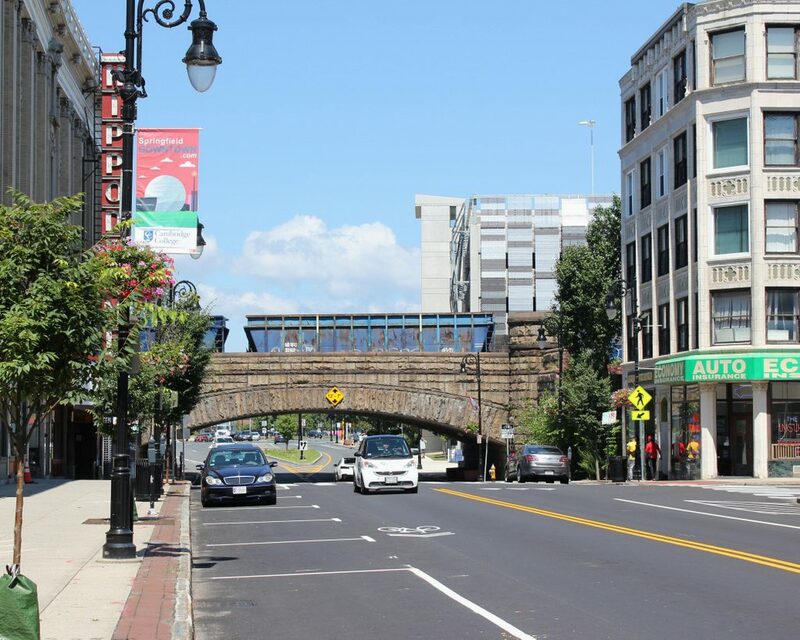 Hampden Park, located near the North End Bridge, was once used for Ivy League games such as Harvard-Yale and, as is the case here, Brown-Dartmouth. The history of Hampden Park is discussed further in this post, and the game pictured in the first photo on that post is likely the game referenced here on this banner, which Dartmouth ultimately won 24-6. Not much else has stayed the same in this scene; all of the buildings are gone, although parts of the Massassoit House (far left) were incorporated into the Paramount Theatre. However, the 1890 railroad bridge still exists, although the road grade has had to be lowered to accommodate larger vehicles. I have re-created a few other photos of this general area, which can be seen here and here. 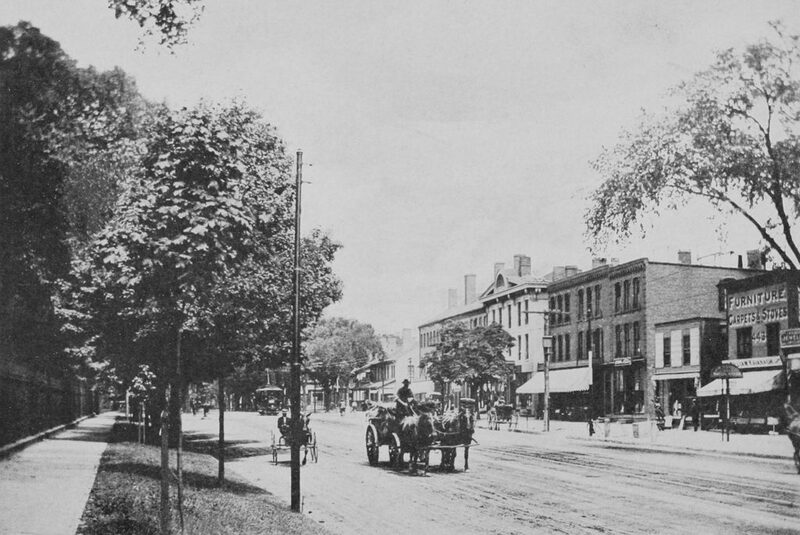 The view looking east on State Street from the sidewalk along the Armory grounds, sometime in the late 1800s. 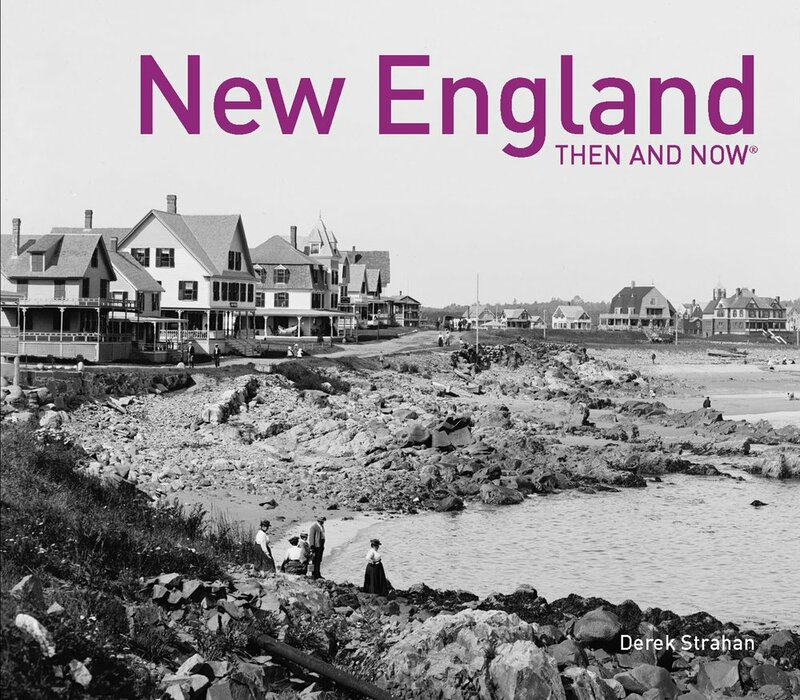 Photo from Springfield: Present and Prospective (1905). The buildings in these photos are the same as the ones in the previous post; the only difference is that they are seen from the opposite direction. 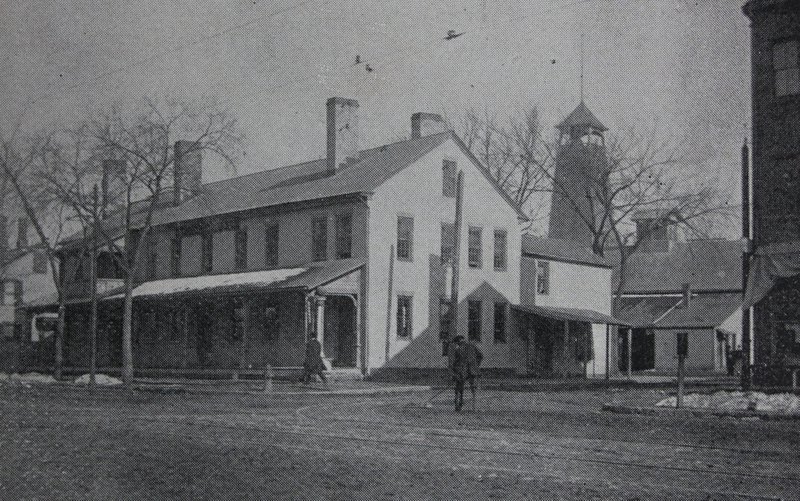 Although these two photos were taken well over 100 years apart, many of the buildings are still there, including the Gunn Block and the two adjacent buildings in the background, which date to the 1830s, and the three buildings in the center of the photo, which likely date to around the time of the Civil War. Even one of the businesses from the first photo almost made it to the present-day; the sign for William Kavanagh is barely visible on the sign above the awning on the building to the far right. Today, the building is gone, having long-since been replaced by a newer Kavanagh building, with a newer sign. 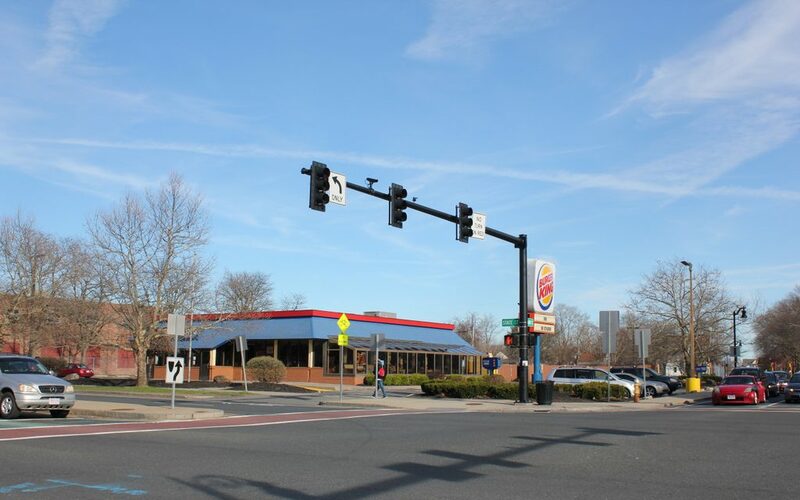 However, Kavanagh Furniture closed in 2008, although it was probably the longest-lasting of all of the businesses from the first photo. State Street looking west from Walnut Street, around 1895. 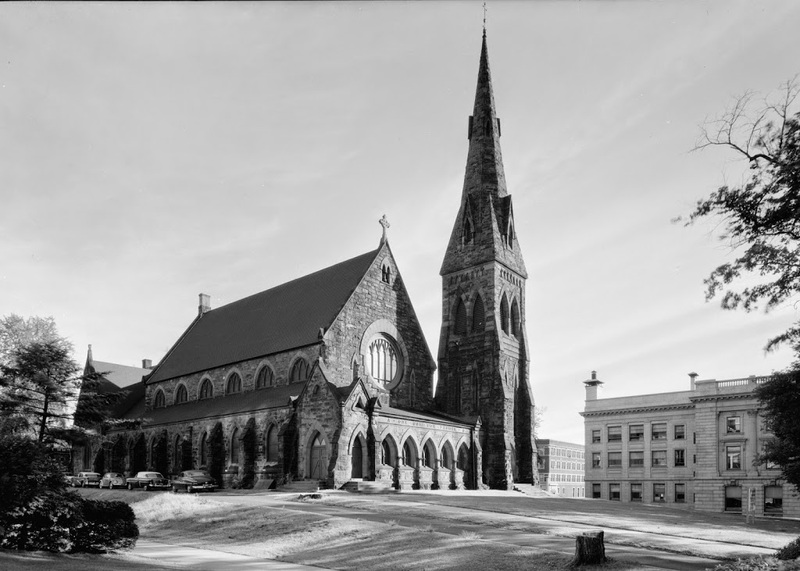 Photo courtesy of James Ward Birchall Collection. 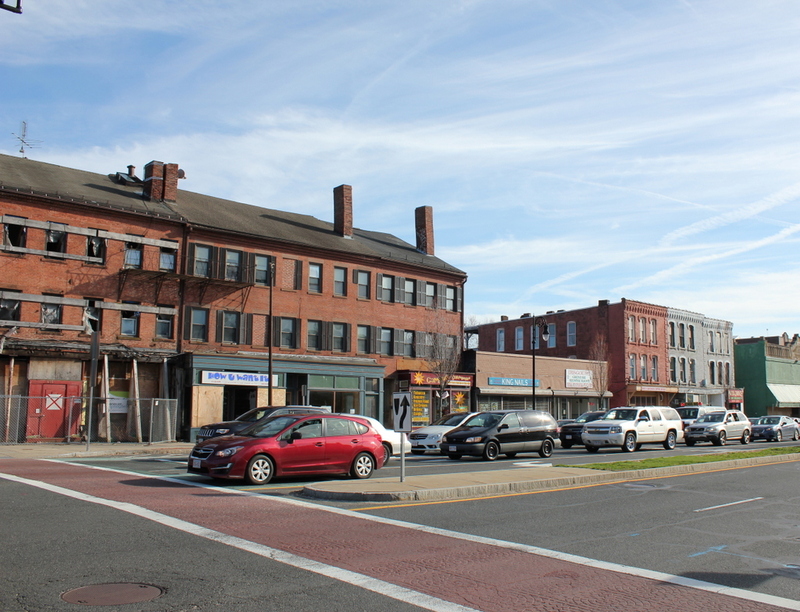 As with the photos in this post, the historic Gunn Block (far left) is visible, along with the other two adjacent buildings, which also date back to the 1830s, making them among the oldest commercial buildings in Springfield; only Byers Block at Court Square and the Guenther & Handel’s Block on Stockbridge Street are of similar ages. Further down State Street is another historic block of buildings; I couldn’t find specifics on these buildings, but based on the architecture they likely date to around the 1860s. 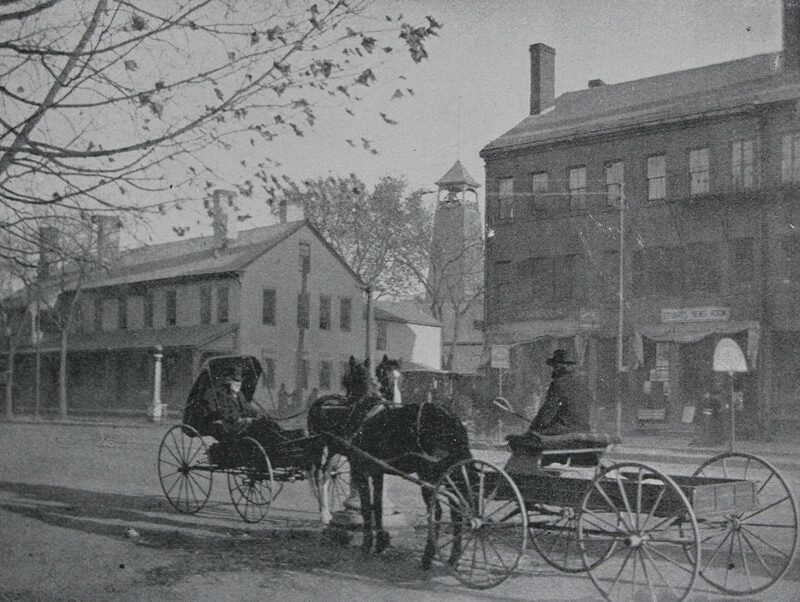 The corner of State Street and Walnut Street, looking east, sometime around 1892. Photo from Picturesque Hampden (1892). 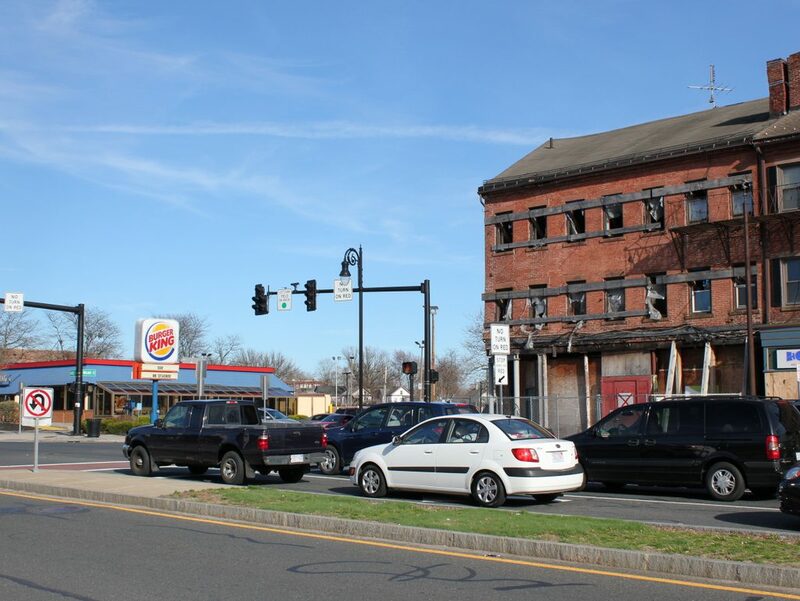 The building on the left in the first photo is the Rockingham House, which is discussed in this post. 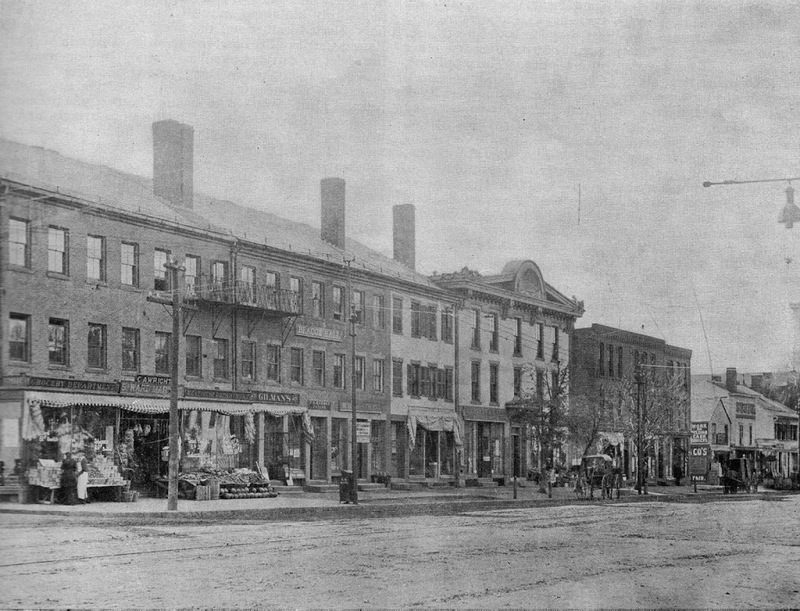 To the right is the Gunn Block, which was built in 1836 and has served a variety of purposes over the years, originally as a store selling “West Indies Goods” but later as a meeting place, offices, a bar, and apartments. 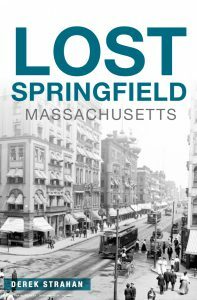 The building is now vacant, but it is owned by the organization Develop Springfield, and will hopefully be restored in the near future. The Rockingham House, on the southeast corner of State Street and Walnut Street, sometime around 1892. Photo from Picturesque Hampden (1892). Built in 1796 diagonally across from the Armory, the Rockingham House was originally called the Armory House, for obvious reasons. 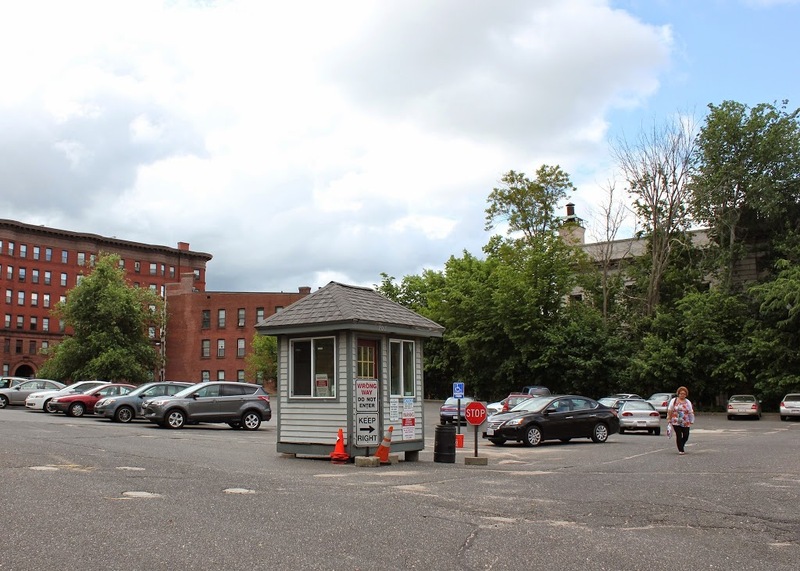 Along with being used as a lodging place for people associated with the Armory, it was primarily used by teamsters in the early part of the 19th century. Long before railroads and Jimmy Hoffa, teamsters were the primary means of overland transportation from Springfield to Boston. It was common for them to bring loads from riverboats up the hill. The inn was conveniently located right at the top of the hill, so they would often stay overnight there before heading out the next morning.